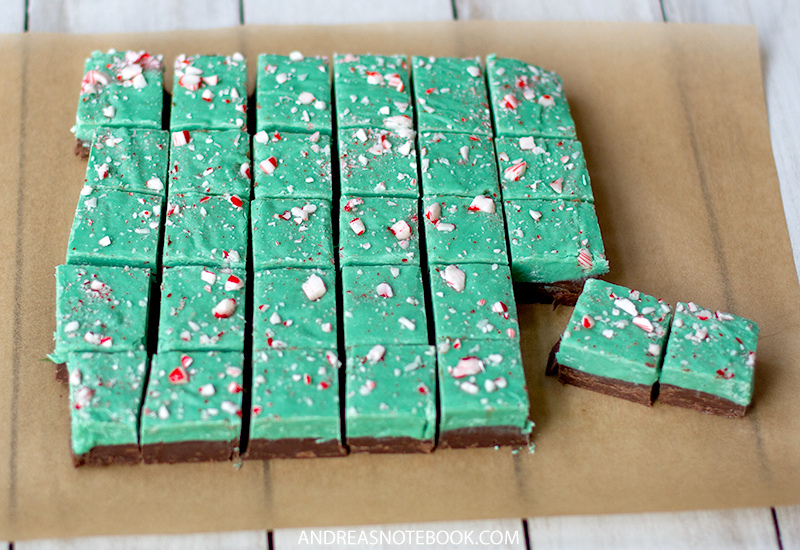 It’s probably no surprise to most of you that I really love the combination of chocolate and peppermint. Whether it’s ice cream, hot cocoa, peppermint bark, cookies or more, I just love it. It’s my favorite part of holiday eating baking. 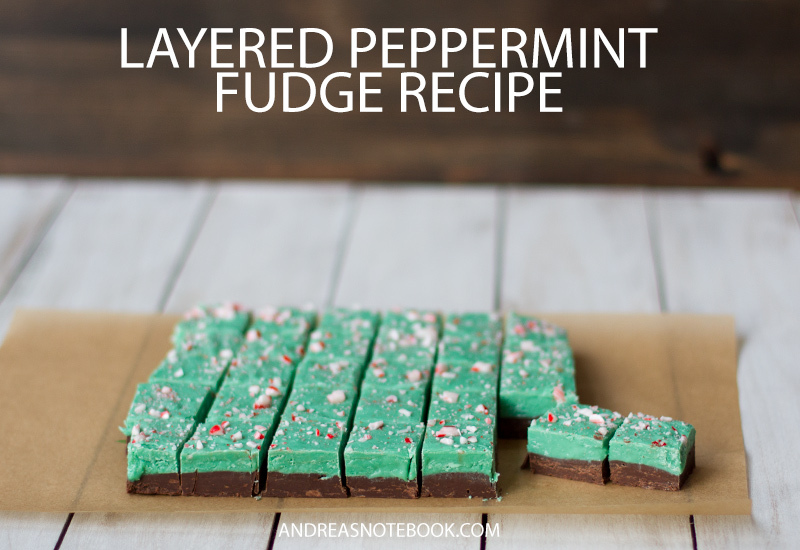 This layered chocolate peppermint fudge recipe came to me while I was making my pretzel fudge this year. 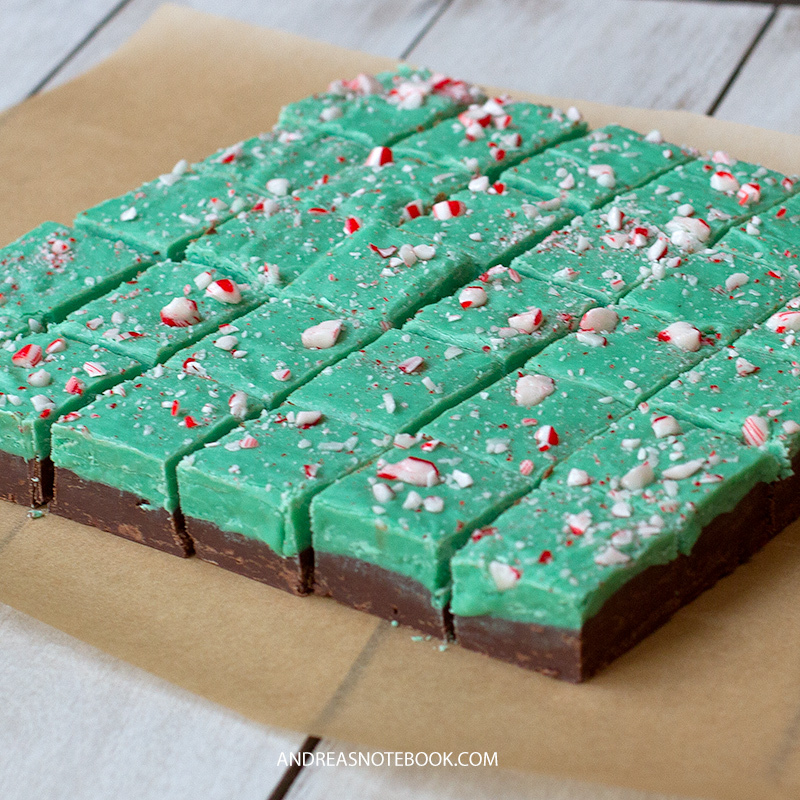 I had found those green peppermint baking chips in the baking aisle and had about 5 bags of them sitting in my pantry, just waiting to be used. To some of you 5 bags of peppermint baking chips may seem excessive, but trust me, you want to have that on hand when inspiration strikes. This recipe is super simple. It takes about 10 minutes to make then a couple hours being chilled. I made mine and then delivered to neighbors the same day. Don’t worry, I saved a bunch for us too. Remember, I did buy FIVE bags of the green. We had plenty left over to eat ourselves. We’ll be munching on it for weeks to come. That’s what is so great about fudge. Just keep it in portions in the freezer and take out when you’re ready! 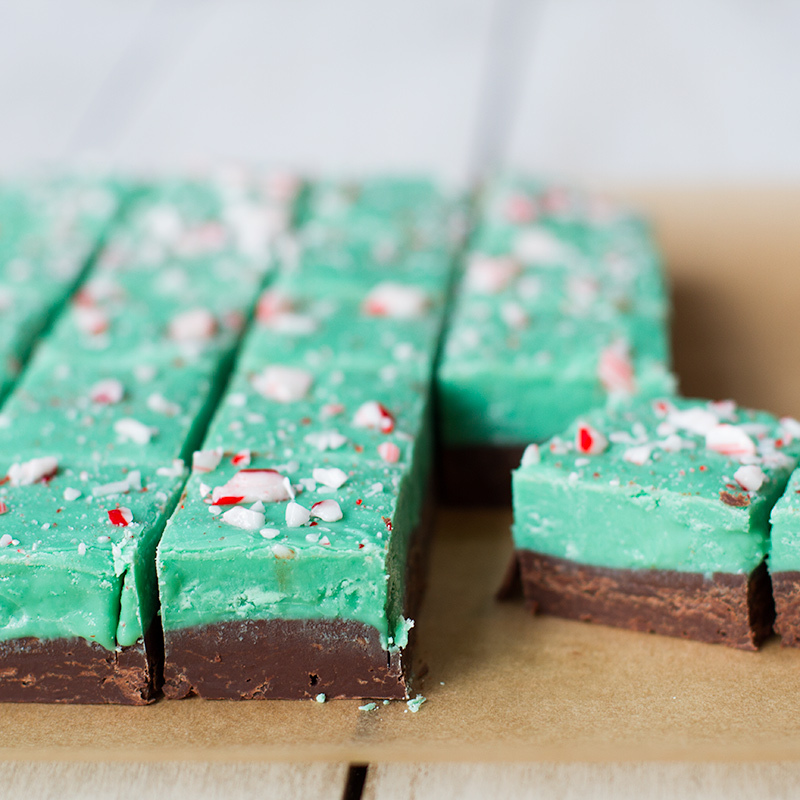 This layered chocolate peppermint bark fudge takes just 4 ingredients. If you don’t have the green baking chips you can sub out white chocolate and peppermint extract. Add a little food coloring if you wish. Prepare a 9×13 baking dish by lining with foil or parchment paper. In a heavy bottomed pan or double boiler, melt the chocolate and one can of Sweetened Condensed Milk until mixed. Pour into the baking dish. Chill for 5 minutes while preparing the peppermint layer. In a heavy bottomed pan or double boiler, melt the peppermint baking chips and the other can of Sweetened Condensed Milk. Pour into the baking dish on top of chocolate layer. Place into the freezer for 2-3 hours to set. I recommend removing after about 45 minutes to cut then put back into the freezer. Fudge can be very difficult to cut when fully frozen. So popular is this game of pokemon go online. These cheats for ps3 and xbox can be used easily. get money and RP using this online hack. with free online money generator you can get unlimited reputation and hacking secret. if you are a student, I have a quite nice opportunity for you. We have been into the education industry from past few years, delivering quality essay and assignment works for students as well as working professionals. We are GoAssignmentHelp which helps in finance assignment help online, marketing plan assignment help for students and learning professionals. Top experts are working in our team they have knowledge in different academic disciplines and these areas English, economics, history, management, IT, law, arts, nursing, hospitality, etc. So students can easily get amazing assignment offers today. At StudentsAssignmentHelp.com Our team is offering best and high-qualified free essay topics.